Children go through developmental stages in art helping them hone their budding skills and explore their creativity. Once a child figures out she can make somewhat representational squiggles, she has embarked into the preschematic stage of art. These potato shaped figures with stick arms and legs might not seem like much, but are a child’s first representations of people. Encouraging her drawings aides in her future cognitive and creative development. Viktor Lowenfeld, author of Creative and Mental Growth, describes the preschematic stage as a time when the schema (the visual idea) is developed. A child, between the ages of four and seven, creates drawings during this stage that depict what she finds most important about the objects she sees, such as someone’s hair or unique clothing. A child exploring the preschematic stage doesn’t have full understanding of the dimension and size of objects, so may draw a person as tall as a house. Color use is also more emotional than logical, expressing a child’s desire for creativity and enjoyment in her art. Preschematic stage artwork resembles blobs or amoeba shapes with large smiling faces and short arms and legs. Don’t be alarmed with exaggerated features, such as an extremely large nose or mouth- or if the child omits features completely. In other instances, a child may draw a head representing a whole human being, because she finds the head to be the most important part of their body, which she uses to eat, talk, see and hear. 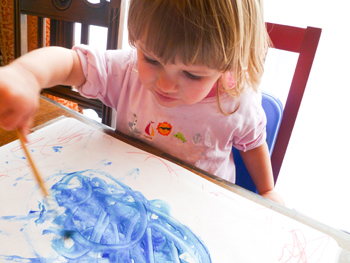 When a child draws a self-portrait during the preschematic stage, she often draw herself as the largest shape – as she feels she is the most important – which displays healthy development. During the preschematic stage, the schema (the internal representation of the world) along with cognitive development, causes the young child’s brain to develop in grand ways. Jean Piaget, a Swiss philosopher and psychologist, finds children go through fixed stages of cognitive development. During the preschematic stage, Piaget places a child at the preoperational stage where she is unable to yet form abstract conceptions, and must have hands-on experiences and visual representations in order to form basic conclusions. With the right-brain in charge of creativity, but the left more dominant with control over math, rational thought, and linear thinking, the young child entering the preschematic stage needs help to stimulate her visual cortex and promote use of her creative right-brain, developing a whole human. By introducing and discussing art with the child, she is stimulated to learn more about, and question, the world around her. Involving the child in making decisions about an art activity keeps her interested in creating art and promotes her self-esteem. Encourage a child to explore the preschematic stage, along with her preoperational stage of development, through engaging in lots and lots of hands-on activities to boost cognitive development and self-confidence. Sean Brotherson, a Family Science Specialist, finds that children need simple hands-on experiences for their brains to develop. Activities such as building with blocks, organizing objects based on color or shape, or taking a nature walk along with picking leaves off the ground are wonderful ways to jump-start brain development and get both sides of the brain working together. -Encourage the child to create a family portrait based on a photograph, giving her a visual representation to work with. Look at a family picture together discussing the people in the picture and interesting characteristics of each person, encouraging her observational skills. -Offer the child markers to use for drawing the family portrait so she can create strong, bold lines. Allow the child to fully explore her preschematic expression of color by using them as she wishes, even if not representational. Encourage the child’s color recognition skills by asking her about the colors she uses as she draws, further helping her cognitive development. -Once the portrait is finished, help the child write a short paragraph about what she drew engaging the left-brain to work with his creative right-brain. Ask your child questions such as, “what are you doing in this picture,” or “who are all these people?” Alway encourage your child to tell you about her artwork, allowing her to share her story, encouraging her feelings of self-worth. -No matter the time of year, getting outside and combining science and art benefits the development of the budding young brain. Provide the child with a small basket for her to pick up items while walking and discussing different plants and animals observed, benefiting her preoperative brain. -Let the child select a large sheet of colored construction paper and invite her to glue the items she collected in any arrangement of her choosing, which gives her hands-on experience for her cognitive development. -Once the items have been glued to the paper, offer the child a black marker to carefully outline the items in the collage, helping hone her fine-motor skills. -When finished, help your child write a short story together about walking in the woods, or exploring nature. It can be based on real events or full of fantastic creatures! The preshematic stage is full of discovery and expression. Benefit a child’s development by encouraging her to explore her creativity and learning through engaging hands-on activities along with spending quality time together, which benefits everyone involved! I really liked this. In fact, I am printing it out to share with Lila’s dad.